Since 1989 Angela Johnson has been steadily producing exceptional books for young people, ranging from picture books for children to novels, poetry, and short stories for young adults. Her works have earned her the adoration of fans and the admiration of reviewers, many of whom have commented on her exceptional ability to create memorable, real characters who stay in readers' minds long after the book cover has been closed. In most of her books Johnson addresses personal, everyday subjects: family relationships, the difficulties of growing up, seeking comfort from loved ones during times of struggle. A number of reviewers have noted that, while many of Johnson's characters are African American, the circumstances they confront and the emotions they express are so true to life that they can be appreciated by all readers. Johnson's editor, Kevin Lewis, stated in an article for the Knight Ridder/Tribune News Service, "A reader might begin thinking that they have nothing in common with [Johnson's characters], but by the end they realize that the list of things people share—things like family, friends, struggle, change, love, loss, dreams, and so on—is much more profound [or, meaningful] than the list of our differences." Born in 1961 in Tuskegee, Alabama, Johnson grew up in Alabama and Ohio. Reading and listening to stories was a significant part of her childhood. Her father and grandfather were natural storytellers, and Johnson can pinpoint the moment when she realized that her own fondness for stories was more than a passing interest. As described on the African American Literature Book Club (AALBC) Web site, Johnson recalled hearing a particularly compelling storyteller during her early school years. She realized that the characters of her favorite books had come alive in her mind, becoming as real as the children sitting next to her in school. "That is when I knew," she remembered. "I asked for a diary that year and have not stopped writing." "Kids and teens are so much more interesting than adults. Life is happening when you are a teenager. One minute you're a child, the next you're allowed to go out in the world by yourself. Who knows what will happen?" One of the ideas that has occupied Johnson as a writer is a child's search for truth or, rather, the quest to uncover what she calls "the big lie"—the feeling that one's parents might not be who they seem, or that the things a child has always accepted as reality might not be true. In an interview in the magazine Booklist, Johnson stated: "There's always that point when kids rifle through their parents' papers to make sure they weren't adopted. I was probably about nine or ten when I picked my dad's lockbox with a bobby pin. And it's really interesting because I didn't have that big lie in my life! But I had so many friends who did." She went on to say that once she became a writer she realized that "you can get a great story from the big lie." Toning the Sweep (novel), Orchard, 1993. Humming Whispers (novel), Orchard, 1995. Songs of Faith (novel), Orchard, 1998. Heaven (novel), Simon & Schuster, 1998. Gone from Home: Short Takes (short stories), DK Publishing, 1998. The Other Side: Shorter Poems (poems), Orchard, 1998. Maniac Monkeys on Magnolia Street (short stories), Random House, 1999. When Mules Flew on Magnolia Street (short stories), Knopf, 2000. Running Back to Ludie (poems), Orchard, 2001. Looking for Red (novel), Simon & Schuster, 2002. A Cool Moonlight (novel), Dial, 2003. The First Part Last (novel), Simon & Schuster, 2003. In the Booklist interview Johnson recalled her "fantastic childhood." She acknowledged that she became moody and angry as a teenager, and that during high school her writing was extremely personal. She wrote only for herself, as a way of expressing feelings of frustration and alienation. On the AALBC Web site, she described her writing from that period as "punk poetry that went with my razor blade necklace." She recalled in Booklist, "I wrote the darkest poetry about cityscapes and disintegration and rats. The literary guild at school wouldn't accept any of my work, which I think nurtured me because it made me even angrier." While she had been writing since early childhood, Johnson was not very interested in reading until a high school English teacher showed her the works of some of the Beat poets, writers who, during the 1950s, wrote experimental, nontraditional verse to challenge mainstream, middle-class ideas about art and life. In addition to such poetry, Johnson enjoyed reading factual works about real people. She explained in Booklist: "When I was a teenager, I only read nonfiction. I didn't want to read anything that wasn't true. I was immersed in people's lives—Janis Joplin, Malcolm X. I wanted to know the real story." After graduating from high school, Johnson attended Kent State University in Ohio, studying special education. She left college without earning a degree, and from 1981 to 1982 she worked in childhood development as a participant in the program known as Volunteers in Service to America, or VISTA. Although she had been writing poetry and stories for many years, Johnson did not think of writing as a realistic career goal. During her college years, though, she met a writer who encouraged Johnson to re-define herself. Working part-time as a babysitter for acclaimed children's author Cynthia Rylant, Johnson was eventually persuaded to show Rylant some of her writing. Recognizing Johnson's gifts, Rylant urged her to focus on writing for young people. A few years later, in 1989, Johnson published her first work, a picture book called Tell Me a Story, Mama. Over the next several years Johnson produced a number of well-received picture books for young children, including Do Like Kyla, The Leaving Morning, The Girl Who Wore Snakes, and Julius. While she would continue to create picture books for many more years, in 1993 Johnson began to create works with an entirely different focus, releasing her first novel aimed at young adults. Toning the Sweep tells the story of fourteen-year-old Emmie, who journeys with her mother to the home of her Grandmama Ola in the California desert. Ola is dying of cancer, and Emmie and her mother have come to help her make the move to Cleveland, Ohio, where she will spend her final months surrounded by family. While in California, Emmie tags along on her grandmother's visits with friends, videotaping their conversations and recording the friends' good-bye messages to Ola. In so doing, she discovers a great deal about her grandmother and about tragic events in her family's past. Reviewers praised Johnson's understated, realistic style of storytelling, noting that rather than spelling out every detail, the author encouraged readers to use their imaginations. In 1994 Toning the Sweep won the Coretta Scott King award, an annual honor given by the American Library Association to outstanding works for young people by an African American author. Johnson's next young-adult novel, Humming Whispers, published in 1995, tackled the difficult subject of mental illness. Sophy, fourteen years old and training to be a dancer, worries about her older sister, Nikki, who suffers from schizophrenia, a serious mental disorder that dramatically affects feelings, thoughts, and behavior. Nikki first developed symptoms of her illness at age fourteen, and Sophy's anxieties for her sister also extend to herself: she is concerned that she too will begin to show signs of schizophrenia. Johnson was able to balance the serious and painful subject matter with a strong sense of the strength the characters were able to derive from their family members and friends. A reviewer for Publisher's Weekly described Humming Whispers as "a story of subtle but real hope, in the form of strong, abiding human connections ... and moments of understanding and acceptance." Family connections also played an important role in Johnson's 1998 novel Songs of Faith. Set in a small Ohio town in 1976, this book explores the impact of their parents' divorce on Doreen and her younger brother, Robert. Johnson does not shy away from difficult subjects in her writing, and she portrayed these topics in an honest, realistic light, showing that the love and support of family and friends, while not removing the pain altogether, can help make it bearable. Johnson has applied her considerable talent for relating memorable characters and interesting situations to other genres as well, including short stories and poems. In 1998 she published Gone from Home: Short Takes, a collection of short stories. The following year, she released The Other Side: Shorter Poems, a book of verse written in plain, everyday language. The loosely connected poems, based on recollections of her childhood, capture details of life in the small town of Shorter, Alabama. Yet another book, made up of poems that link together to tell a story, Running Back to Ludie examines a teenage girl's reunion with the mother from whom she was separated. In her 1999 novel Heaven, another winner of the Coretta Scott King award, Johnson reexamines the meaning of family connections. Fourteen-year-old Marley enjoys a contented, secure life with her parents and brother in a town called Heaven. She goes to school, plays with her friends, and looks forward to the engaging letters she occasionally receives from her traveling uncle. One day she learns that things are not what they seem: her "parents" are actually her aunt and uncle, while her "Uncle Jack" is really her father. Furious that she has been deceived by the people she loves the most, Marley must come to terms with her feelings of anger and betrayal, and she must redefine her notion of family. In 2003 Johnson set a second novel in the town of Heaven. In The First Part Last, she depicts the life of Bobby, a teenage boy who is single-handedly raising his baby daughter. The First Part Last is a prequel to Heaven, telling a story that takes place before the events that unfold in the 1999 novel. Just sixteen years old, Bobby must abruptly enter adulthood when he takes responsibility for raising his daughter, Feather. The chapters alternate from the past to the present, switching back and forth from the months before his daughter was born to his early struggles as a single father. Kevin Lewis, Johnson's editor, told the author that a group of sixth graders had said that Bobby was their favorite character from Heaven. When he asked her if she thought Bobby could be the subject of a new novel, Johnson initially said no. Johnson recalled in Booklist, "At first I thought, absolutely not. Usually, when I finish a book, it's done. The characters have folded up their bags and walked on home." But one day on the subway in New York, she saw a teenage boy with a baby. Her first thought was that the baby was the boy's sister, but then it occurred to her that she could be his daughter. She explained in U.S. News & World Report, "I kept thinking about what life would be like for him. Mostly, boys are portrayed as clueless, and they desert their girlfriends. But what about the boy who does the right thing?" From these imaginings, Johnson spun the story of Bobby and Feather, a novel that earned high praise from critics. A Publisher's Weekly reviewer wrote: "Each nuanced chapter feels like a poem in its economy and imagery; yet the characters ... emerge fully formed." In 2004 The First Part Last earned Johnson her third Coretta Scott King award, as well as the Michael L. Printz Award, given for excellence in young adult literature. In early 2004 Johnson announced that she was at work on a third novel set in the town of Heaven. After years of writing books in a variety of forms for a variety of age groups—and earning prestigious awards and high praise from both readers and reviewers—Johnson learned in late 2003 that she was the recipient of an extraordinary honor. She had been named a MacArthur fellow, receiving a $500,000 grant known as the "genius" grant. The prize came from the John D. and Catherine T. MacArthur Foundation, a private organization that, among other things, awards grants to exceptionally talented people in a variety of creative fields. Described by many as humble, shy, and unassuming, Johnson was quite surprised by the news of having won the grant. She explained in Booklist, "I'm still shocked—the award is still not real to me. I've been so busy that I haven't actually had time to think about how this will change my life. And I guess it won't. I'll still be the person who wears her PJs all day long." She went on to say that, while the publicity and recognition stemming from the MacArthur grant were exciting, she looked forward to getting back to her normal writing routine. "It may not be mountain climbing, but sitting in front of the computer does it for me. It's easy for me to be thrilled." Corbett, Sue. "'Genius' Label Doesn't Erase Author Angela Johnson's Shyness." Knight Ridder/Tribune News Service (February 25, 2004): p. K4506. Engberg, Gillian. 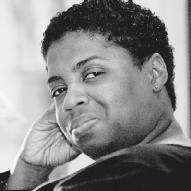 "The Booklist Interview: Angela Johnson." Booklist (February 15, 2004): p. 1074.
" The First Part Last. " Publishers Weekly (June 16, 2003): p. 73. Hallett, Vicky. "When Mr. Mom Is a Teenager." U.S. News & World Report (January 26, 2004): p. 16.
" Humming Whispers. " Publishers Weekly (January 23, 1995): p. 71. "Angela Johnson." African American Literature Book Club. http://authors.aalbc.com/angela.htm (accessed on March 25, 2004). "Angela Johnson's Biography." Visitingauthors.com. http://www.visitingauthors.com/printable_pages/johnson_angela_print_info.html (accessed on March 25, 2004). Johansson, Scarlett Johnson, Dwayne "The Rock"